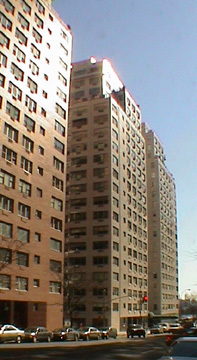 One of two nearly identical apartment towers on the east blockfront of Sutton Place South between 54th and 55th Street, Cannon Point South was built in 1958 as a cooperative. The white-brick, 20-story building is perhaps best known for a photograph of a high-floor tenant fishing from his window in the East River directly below. Needless to say, many apartments have waterviews and those facing south have great vistas of the United Nations complex. The 277-unit building, which is cantilevered over the FDR Drive, not only "backs" on the river, but also has major views to the south towards Beekman Place and the United Nations. 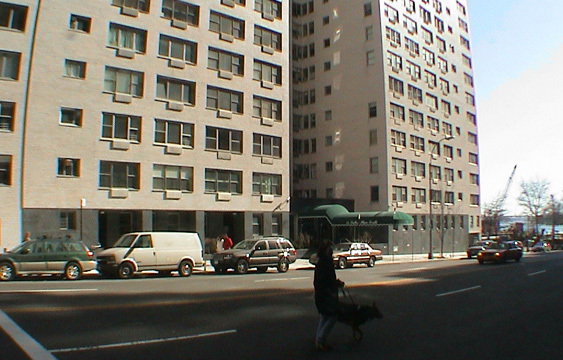 The building is immediately to the north of a very pleasant small park at the base of Sutton Place South. While the facades of these two buildings are relatively plain, the large windows and slightly modulated fronts are quite attractive and pleasant, and the Sutton Place ambiance is superb: quiet, understated and elegant. Although some of the riverfront properties here have their own impressive gardens, there is a nice, small park also at the terminus of 57th Street where there is also a cross-town bus stop. The undeniable charm of the area has always made its residents superfluous to the less than magnificent blocks between it and midtown. The area is never crowded except for July 4th when Macy's holds its spectacular fireworks display further down the river and hordes come for the excellent vantage points. River views from this area have always been heralded for the romantic Queensborough Bridge, but in the late 1990's they became more interesting because of the new high-rise towers at Queens West, a major residential development in Queens across from the United Nations. The building's name, Cannon Point, comes from the fact that the site once held fortifications to ward off invasion of Manhattan and also had until 1921 a shot tower, according to the building's original marketing brochure. The building was designed by Paul Resnick and Harry Green and William Pahlman designed its attractive lobby.